July 16, 2014. The spadix collapsed this afternoon. I'll leave the live video up until Friday, but there's nothing to see here. Move along. Move along. 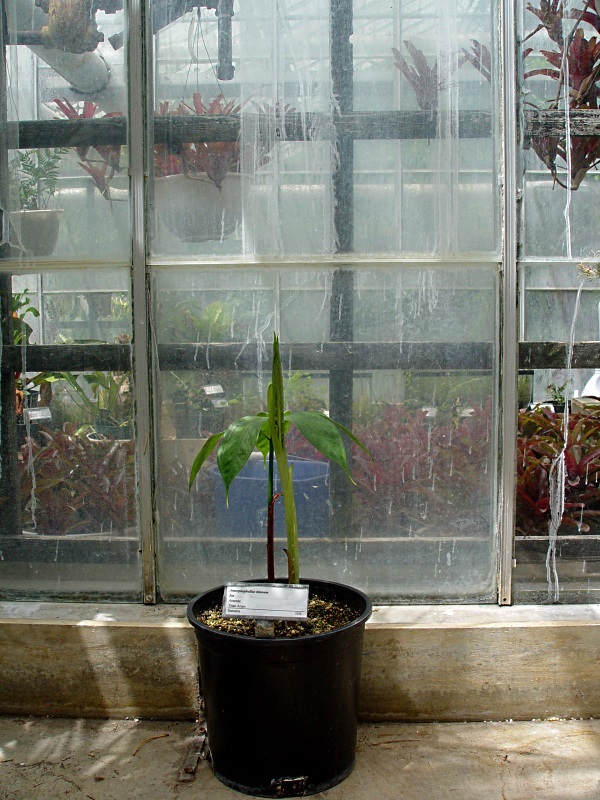 Now that the need to make room for people is gone, the plants have migrated back to the Tropical Room. Back to normal again. Sigh... Weed, weed, weed. Water, water, water. Weed, weed, weed. July 14, 2014. After taking a day-ish off, I have reclaimed my brain from sleep deprivation and the forest has reclaimed the Tropical Room. We had a good turnout on Saturday. About 300 visitors stopped by to look at the flower, some of which were disappointed that they had missed the stinkin' bloom. There was a steady stream of visitors to the greenhouse all day. Around 6 P.M., I noticed some of the visitors were carrying red plastic cups with a bit of bubbly in them. When I asked where the cups with soda came from, one visitor said there was a taco buffet dinner and 7 P.M. performance next door at Doudna as well as a wedding reception over at the MLK Union. Well, that explains the influx of visitors late in the afternoon 'til about 8 P.M. So, over the two-day event, we had a total of about 800 warm bodies who came to look at and smell the flower and about 6,000 who viewed it over the Internet through the live feed. I mentioned in March that in 2012 the tuber had provided a number of tuber-babies as a result of a "failed" bloom. Four of the tuber-babies are growing nicely and I transferred them from six-inch pots to two-gallon pots in mid June so they would be happier. The smallest, 7-gram one, rotted and died. Interestingly, all of the surviving ones have sprouted two or three leaves. Huh. 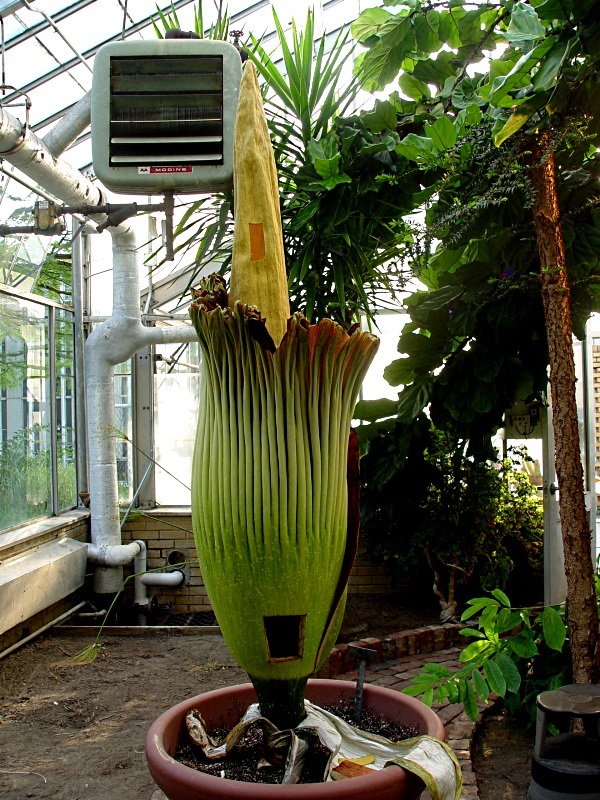 Well, anyway, if you want to look at more pictures from cloning the tuber, here's a PDF of me and the Titan Arum cloning around. Now that we have five Titan Arums, I have given them names so we can keep track of them. These clones of "The Velvet Queen" should bloom sometime in the next seven or eight years. 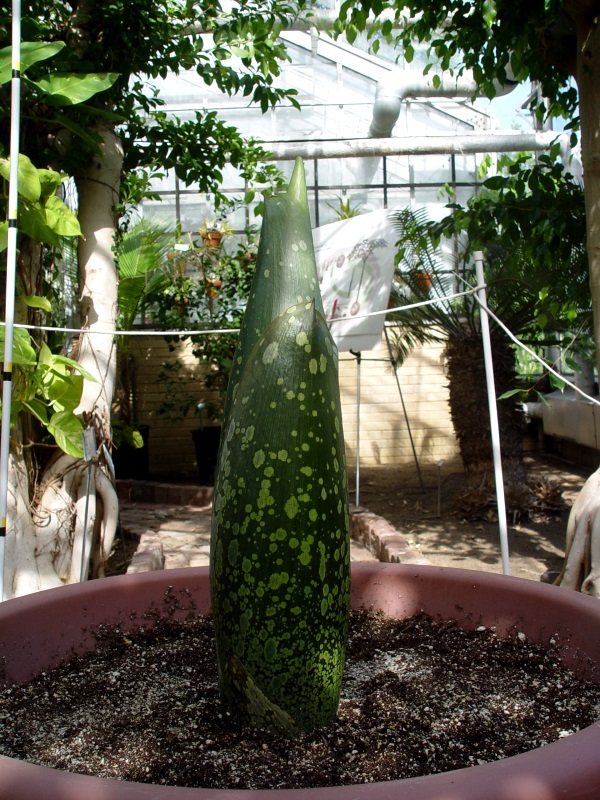 As an aside... A number of visitors noticed the Amorphophallus konjac growing in the garden outside. It's leaf is similar to A. titanum, but is much smaller. I put the A. konjac outside in the garden each spring where it will be happier than in a pot and bring it in each autumn after it goes dormant. It blooms every spring and the odor of rotting meat tends to gas me out of the greenhouse, so I banish it to the back room until it is more sociable. Here's a PDF of it blooming this past spring. 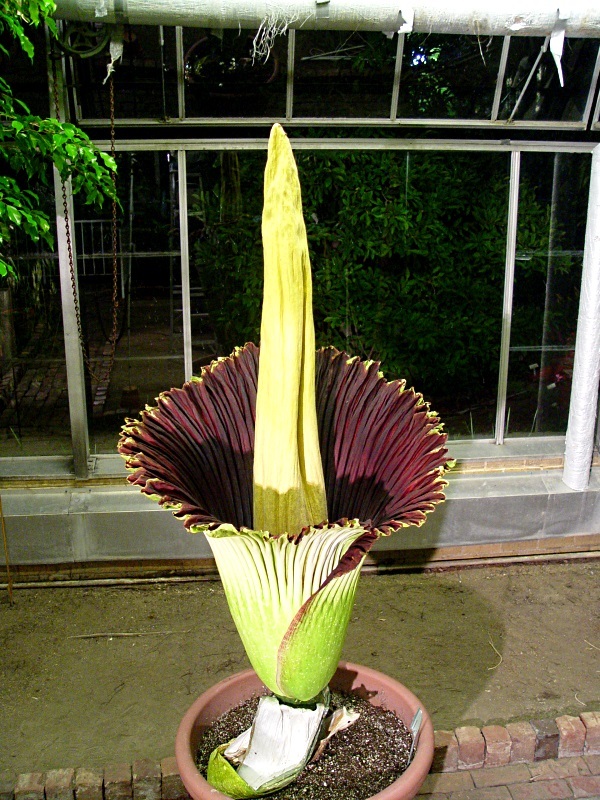 1:30 A.M. We had a nice turnout, about 500 visitors came by to view (and smell) the Corpse Flower. There were approximately 5,000 virtual viewers watching it live over the Internet. Thanks guys and gals for a wonderful experience. Here are some pictures of the bloom. I'm going home. I'll be back around 9:00 A.M.
8:00 P.M. Wow! a constant stream of visitors today from 9AM til 8PM. I have been talking continuously for the past eleven hours, surviving on Mountain Dew. I cut windows in the spathe and spadix this morning with a razor blade and managed to nick my finger with it. I squeezed a little drop of blood onto the plant hoping it would say something like "Feed me, Feed me Seymour." But all it did was sit there and laugh at me. 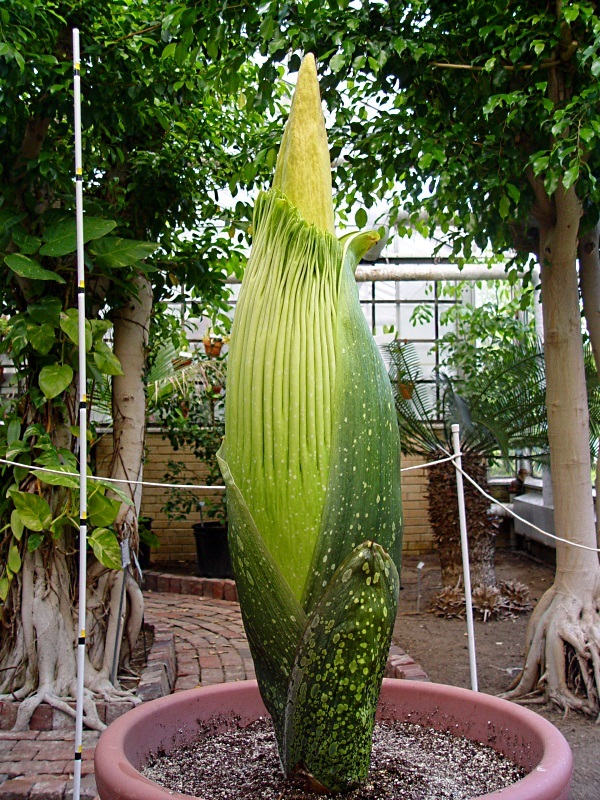 I will leave the live feed up for a week or so to let people watch the declining health of the inflorescence, probably ending the feed after the spadix collapses. Ustream apparently kicks me off line around 2AM each day, so I will need to re-establish the link each morning. Here are some pictures of the inflorescence as it declines. I'm going home. Thank you one and all for visiting. July 11, 2014. 76.0" tall and 45.0" circumference. Bloom Alert! Starting to bloom NOW! 5:30 A.M. Checked the plant. Nose news is no news. No ripening scent detected so far this morning. The spathe is still tightly embracing the spadix. Greenhouse weather: 65 degrees with a beautiful pink sunrise in the east. 1:00 P.M. A visitor noted an occasional puff of an "off" scent this morning and I have noticed the same thing over the past couple of hours. Cheryl stopped by and we both stuck our noses up against the spadix to see if we could smell anything. 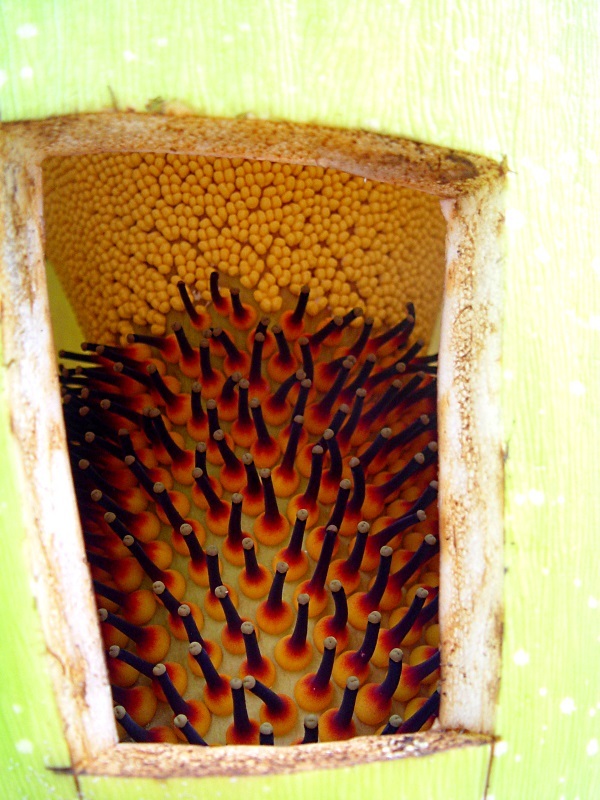 Yep, The spadix is starting to smell, but only up close. I would say we have a 40% chance of it blooming today, a 90% chance of blooming tomorrow and a 40% chance of it blooming Sunday. I will stick around tonight until about 9 P.M. on the off chance that it might try to bloom late in the evening. If it does start to bloom after 8 P.M. I will send the word out. If it doesn't bloom today, there is a VERY, VERY high probability it will bloom tomorrow. 1:30 P.M. 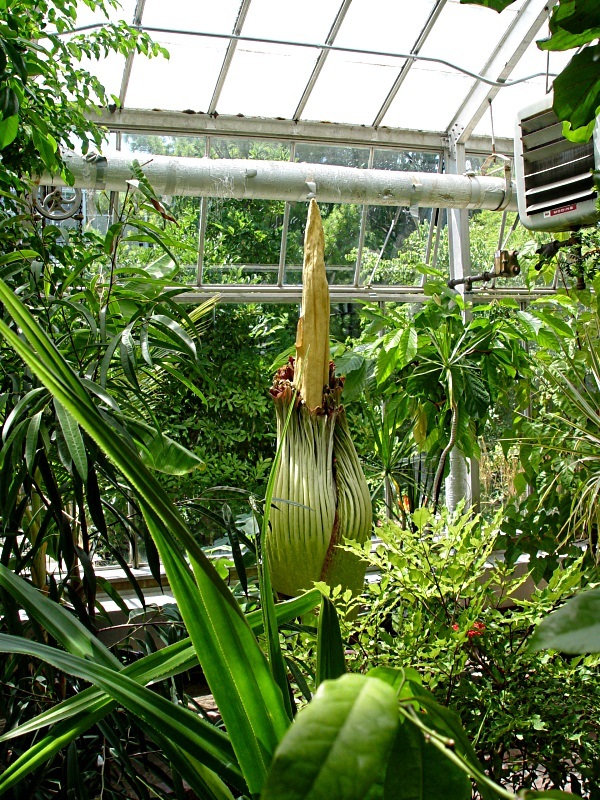 While showing visitors how the spathe will loosen up as it begins to bloom, I noticed that the spathe, is, indeed, loose. It may be blooming this afternoon! Consider this to be the first bloom alert! 2:00 P.M. 76.0" tall and 45.0" circumference. Spathe VERY floppy! Second Bloom alert! This may be it! 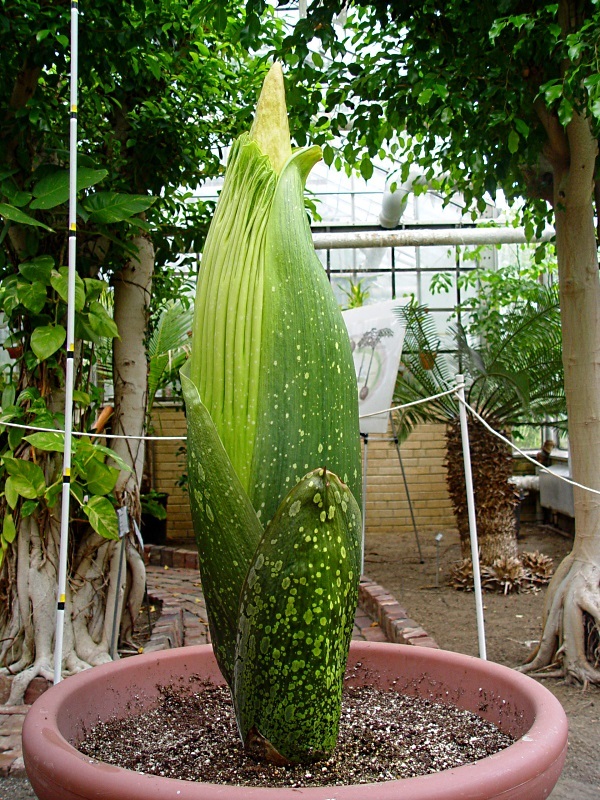 6:30 P.M. Bloom is progressing nicely, although the spathe has not opened as far as fast as I was expecting. However, we still have a long night ahead and the spathe may open more later. Right now it is attracting dozens of flies and is moderately stinky. The greenhouse will be open until midnight tonight. 7:30 P.M. Spadix 93 degrees. Spathe 83 degrees. Warming nicely. Attracting hundreds of flies. Starting to get really stinky. 9:30 P.M. Spadix is cooling down. Now 80 degrees. Stench is not as strong as it was earlier. Fewer flies. 10:00 P.M. I will have the greenhouse open tomorrow from 9AM until 6PM. 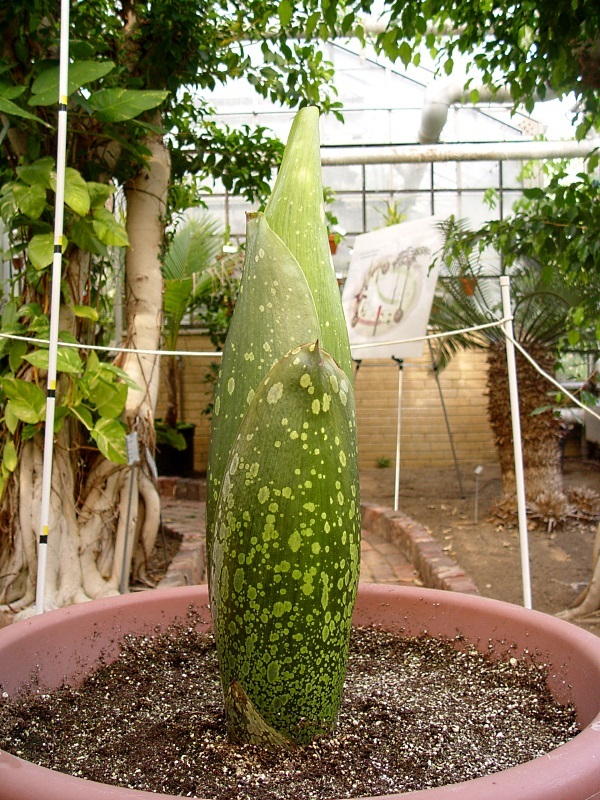 I will cut a window in the spadix and spathe tomorrow morning so people can look inside and see what the inside of the spadix looks like and what the flowers look like. July 10, 2014. 74.75" tall and 44.75" circumference. 9:00 A.M. 74" tall this morning. I did not smell anything unusual when I stopped by the greenhouse at 5:30 this morning. All of the bracts except the last one are crispy critters. The fourth bract fell over last night. 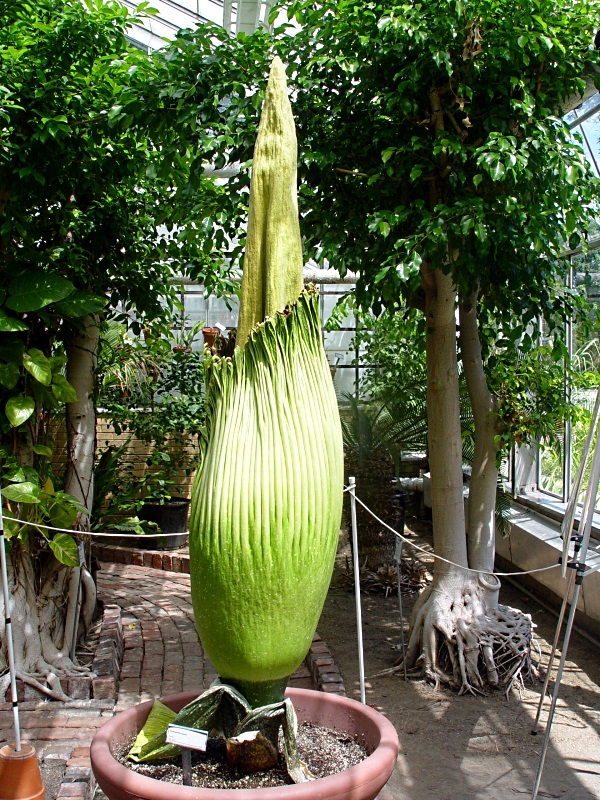 I expect the final bract to fall over today or tonight, which would mean it "must" bloom in two days, Saturday, July 12. The trashman is taking away the dead fish in the dumpster. Good. No more confusing odors. 5:30 P.M. While standing here explaining to a group of visitors how I was waiting for the last bract to fall away, the bract slooooooooooowwwwwwlllllllyyyy sssssssssttttaaaaarrrtttteeed ttttooooo ffffaaaaalllll aaaawwwaaaaayyyyyyyyyy. There. It's down! See the picture above for how it looked just as it was leaning over to collapse. So... based on previous experience, that tells me it "should" bloom Saturday afternoon. However, it could still annoy me by blooming tomorrow. Though I'll take it any day it wants to bloom. I am still waiting to smell the occasional puffs of road kill aroma that it puts out the day before and the morning of the bloom. I have been smelling the occasional "off" smell this afternoon, but it could still be the remains of the dead fish in the dumpster outside. Even though the trashman took away the bulk of the dead fish, their liquid residue remained in the dumpster, producing an occasional wafting odor in the greenhouse when the wind was right. So I went down to the dumpster and opened both covers to let the empty container dry out. Five million flies exploded out of the dumpster when I opened the covers. Hopefully it will dry out and stop giving me false signals. A few flies have visited the spadix this afternoon. I think they can smell something I can't smell (yet). The spathe is dark red and purple inside and the top feels just a bit loose. However, the loosness isn't the inch wide separation that indicates the spathe is opening. I'll stay late tonight until about 8 P.M just to make sure it isn't going to bloom tonight and really, really annoy me! 8:30 P.M. Does not look like it will bloom tonight (I hope). Going home. ttfn. July 9, 2014. 73.25" tall and 44.75" circumference! Anyway, a frequently asked question by visitors is, "Why is your plant blooming every two years?" Well, my working hypothesis is that the better you treat these plants, the less likely they are to bloom. Give them perfect soil, perfect fertilizer, perfect water, perfect temperature, perfect light, and enough room for their roots to grow, and they will be perfectly happy to grow vegetatively. They will grow and grow and grow, and the tuber will get bigger and bigger and will eventually get to be two hundred pounds or so before it blooms. But you will wait many years between blooms. However... if the plant gets stressed while it grows, such as getting root bound in a pot or under watering or cooler temperatures or something else, it may decide that it is not happy where it is. 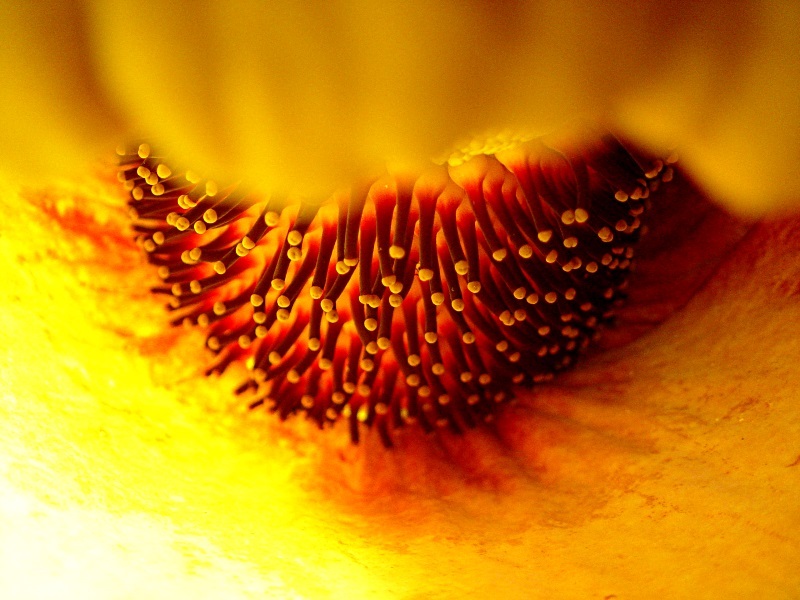 So it blooms, produces fruit, and redistributes itself to possibly better growing conditions. That's why I think some of these plants bloom more frequently than others. Although, I have no scientific evidence to support this hypothesis. 9:00 A.M. As I was walking along the sidewalk on the south side of the greenhouse this morning, I caught a whiff of something that smelled like dead fish in a dumpster. I thought... Uh oh. it's gonna bloom early! Too Soon! I went into the greenhouse and gave the plant the sniff test. Nothing. Went down to the dumpster outside. Bingo! Dead fish in the dumpster. Hundreds of flies. Had me scared for a minute. 1:00 P.M. Looking at my notes from previous blooms, I see the slightly sweet aroma of ripening fruit appeared three days before the bloom. Since I noticed the aroma yesterday, that would put the bloom on July 11. 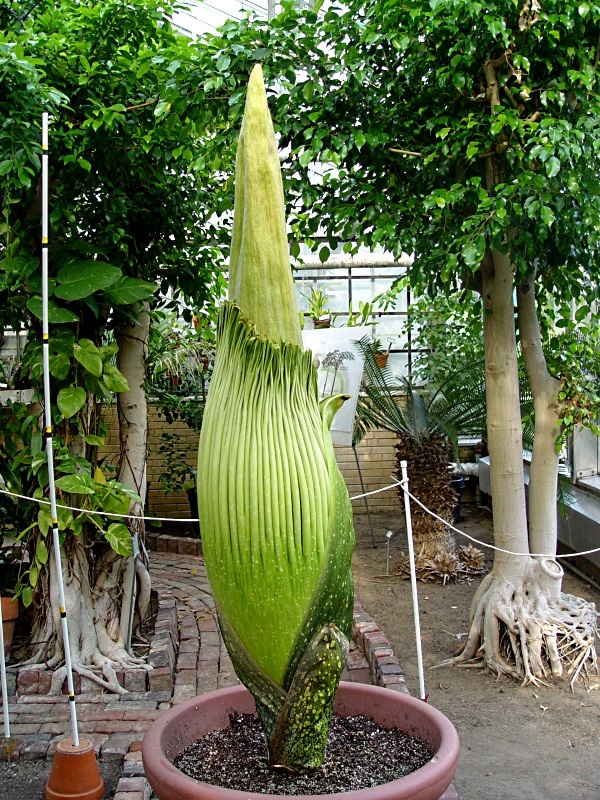 However, I'm still waiting for the last bract to fall away, indicating two days until it blooms, which, if it falls away tomorrow would put the bloom on July 12. I should start to smell occasional puffs of an "off" scent tomorrow. I'll have the greenhouse open earlier tomorrow, around 2PM, and the greenhouse will be open all day Friday from 8 A.M. until 7 P.M. just in case it decides to start doing its thing early Friday afternoon. 6:00 P.M. Well strike up the band and pop the cork on the sparkling grape juice! The Corpse Flower is now the biggest and bestest one we have EVER grown! And still growing! Woot! Woot! 1. 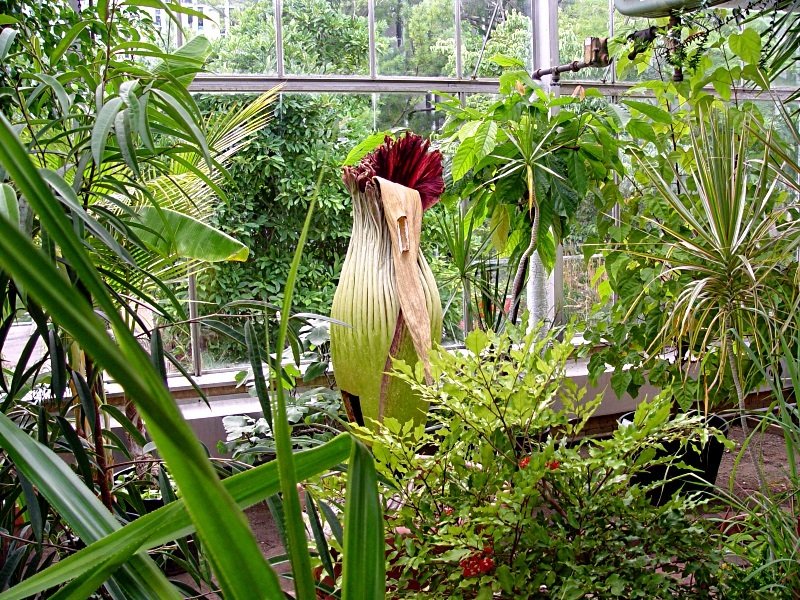 In the early afternoon the spathe will slowly begin to open and by 6 P.M. the spathe will be fully open. 2. 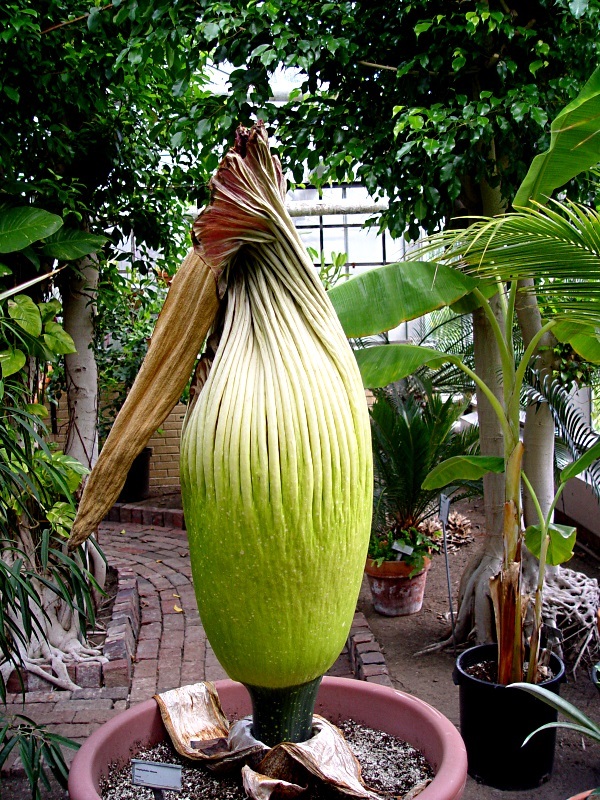 After the spathe is open, the spadix begins producing its fragrance and heats up to human body temperature. 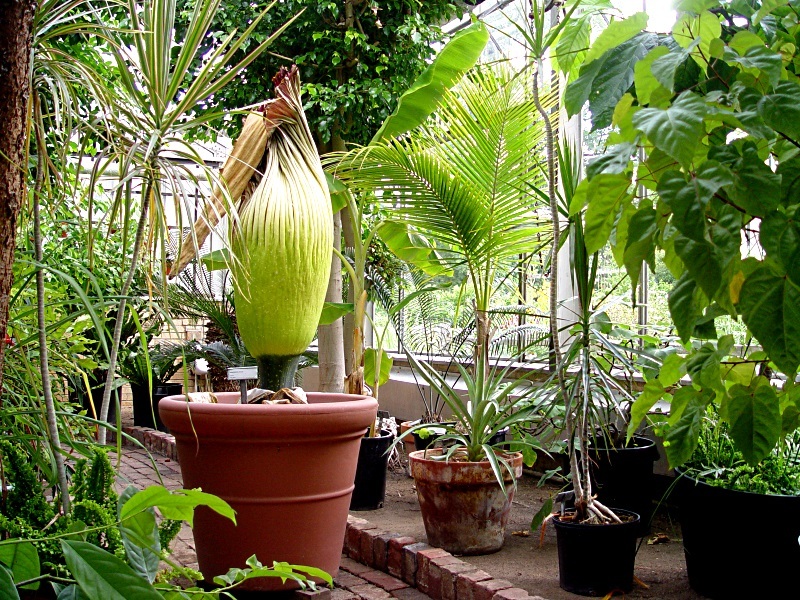 The spadix will produce its fragrance of road kill from about 6 P.M. until midnight and then stop being stinky. 3. 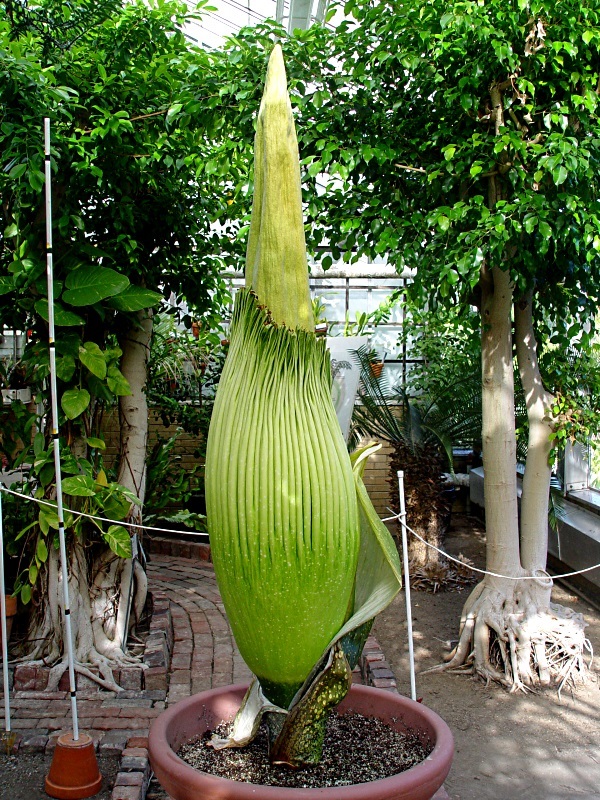 The spathe will remain fully open all night and then start to close up the following morning. By the early afternoon the spathe will be mostly closed up again. I still have my money on Friday or Saturday. July 8, 2014. 70.5" tall and 41.25" circumference. When I came into the greenhouse this morning I noticed a slight aroma of ripening fruit. Something like cantelope. I have detected this aroma before, several days before previous blooms. It dissipated as I opened the greenhouse side vents. We are ohhh sooo close to topping the 2010 bloom height. Another day and we should have it. 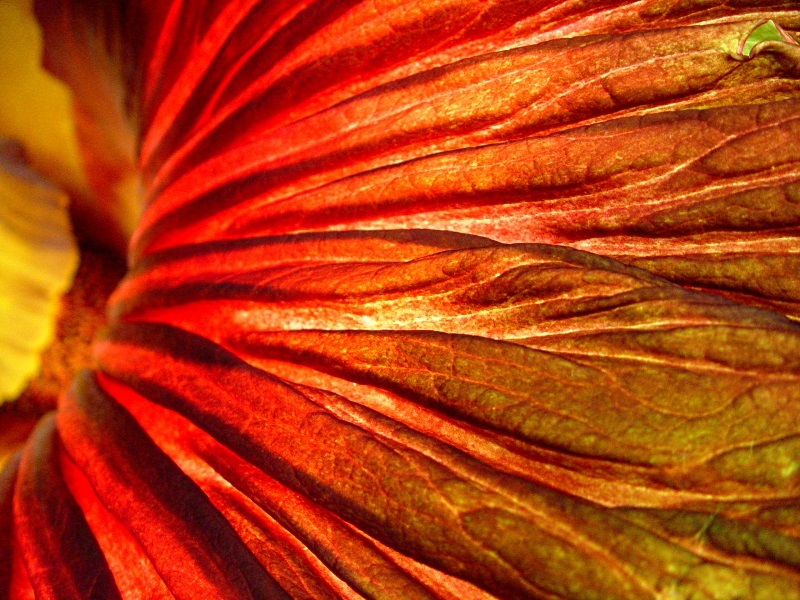 The spathe is dark red on the inside, but still held tightly against the spadix so I can only see the margin. 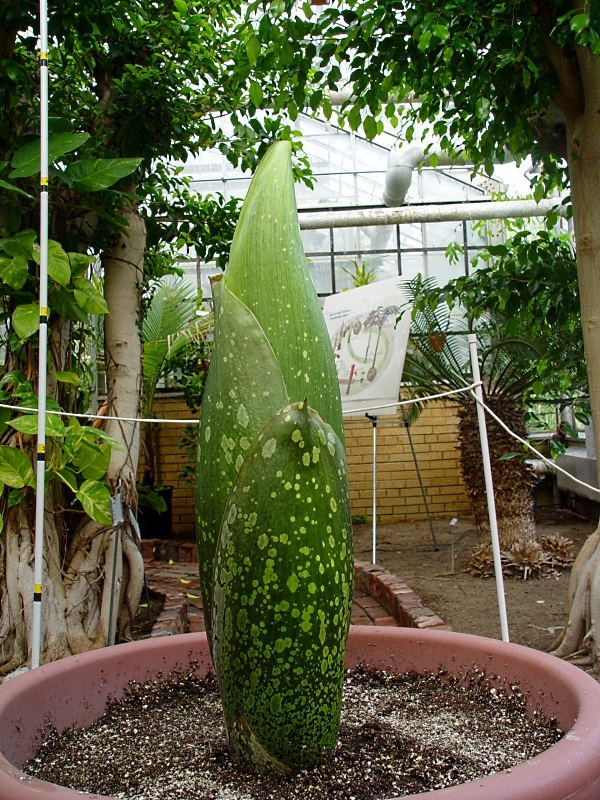 The largest bract is shriveling. 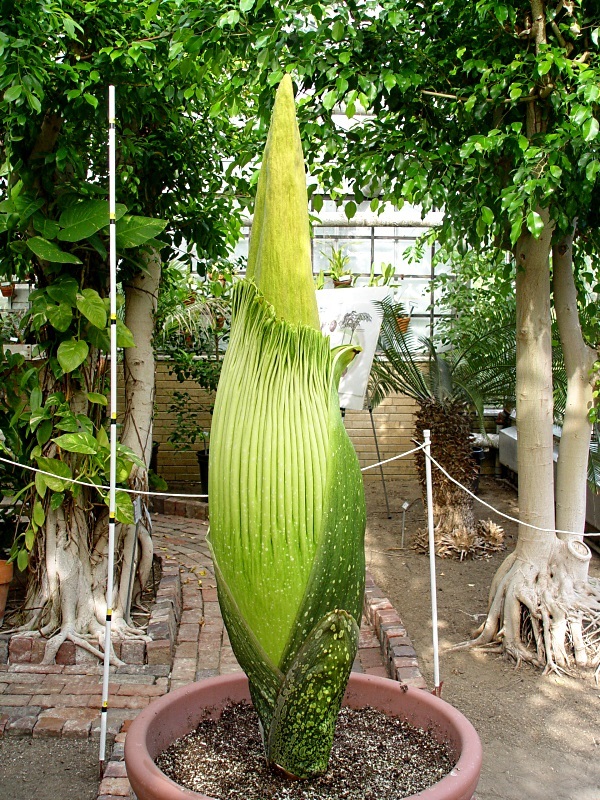 With the spadix growth slowing, I think we are getting close to the bloom. I think July 10 is out. July 11 is mmmmmaybe. If the last bract falls away on July 10, then a definite maybe for July 12. It's just gotta be July 13th if not sooner. I doubt it will wait until July 14. 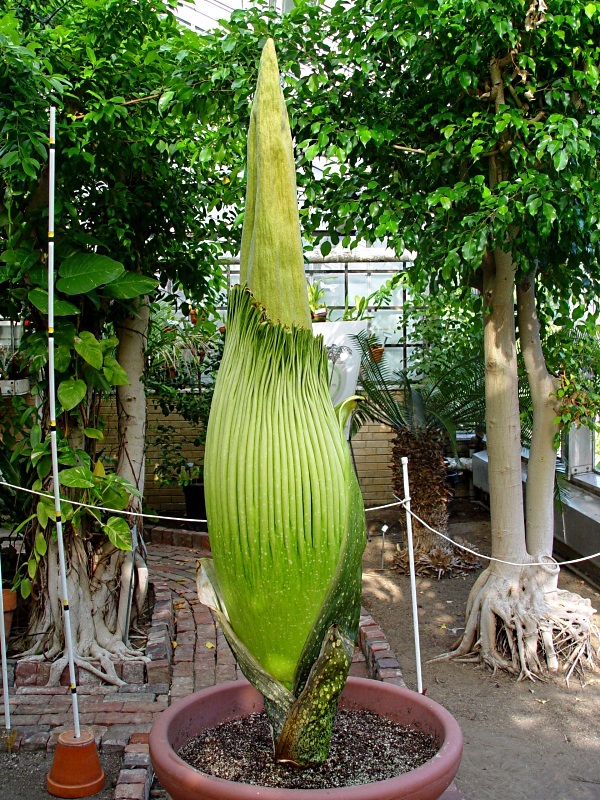 The final final indication before the spathe opens is an occasional "puffing" of an off odor the day before and the morning of the bloom as though the spadix is starting to crank up its motor. 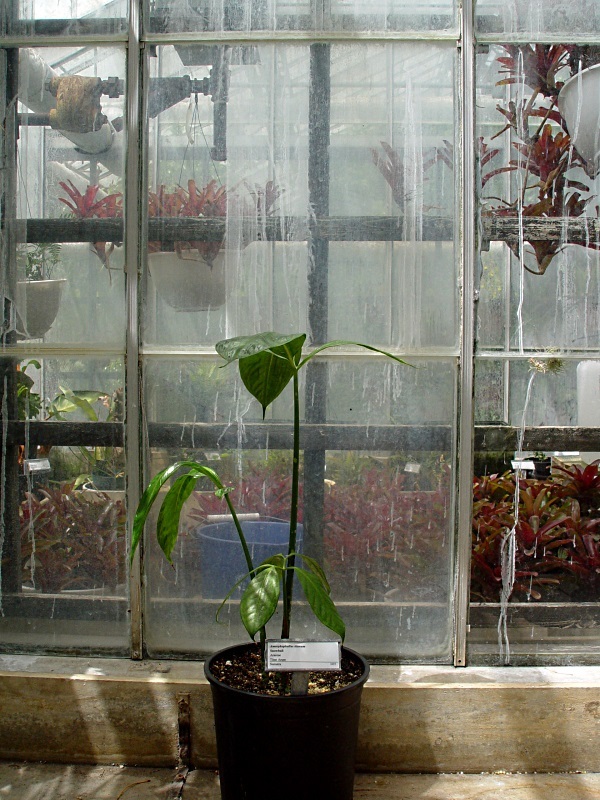 So, if I come into the greenhouse and occasionally smell something a wee bit rotten, then my red flag goes up to indicate a pending bloom within a day or less. July 7, 2014. 67.0" tall and 40.5" circumference. The inflorescence is officially larger than the 2008 bloom and closing in on the 2010 bloom's height. 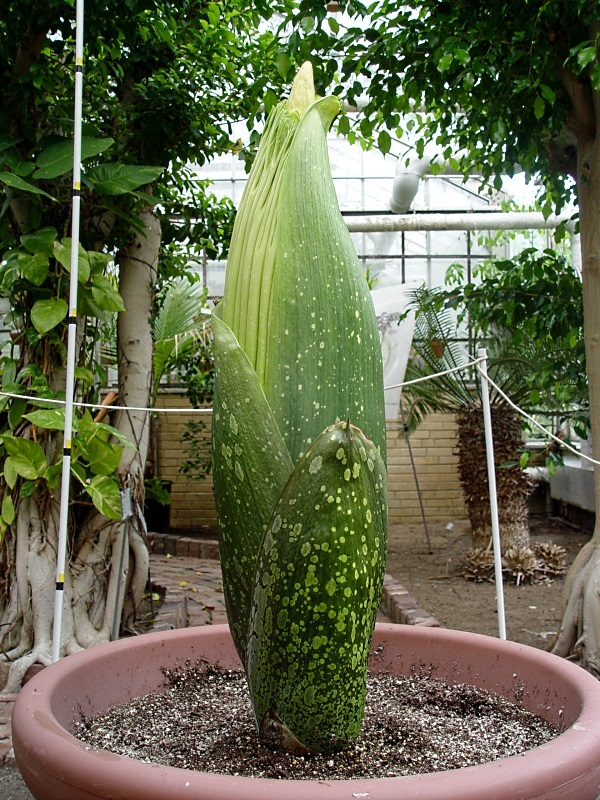 Given that the spadix is growing at about five inches per day, it should top 72" tomorrow. Yay! Still thinking it will bloom around July 11 or 12. Watchful Waiting. July 6, 2014. 62.0" tall and 37.75" circumference. I noticed a wee bit of blush on the spathe this morning. By this afternoon, the blush had increased significantly. So, that tells me it should bloom in five or six days, meaning July 11 or 12. The next milestone is for the last (and largest) bract to fall away. Then the bloom will be two days away. July 5, 2014. 57.25" tall and 36.25" circumference. I had to get a step stool to measure the height today and it looks like my yardstick is going to be too short to measure the circumference. 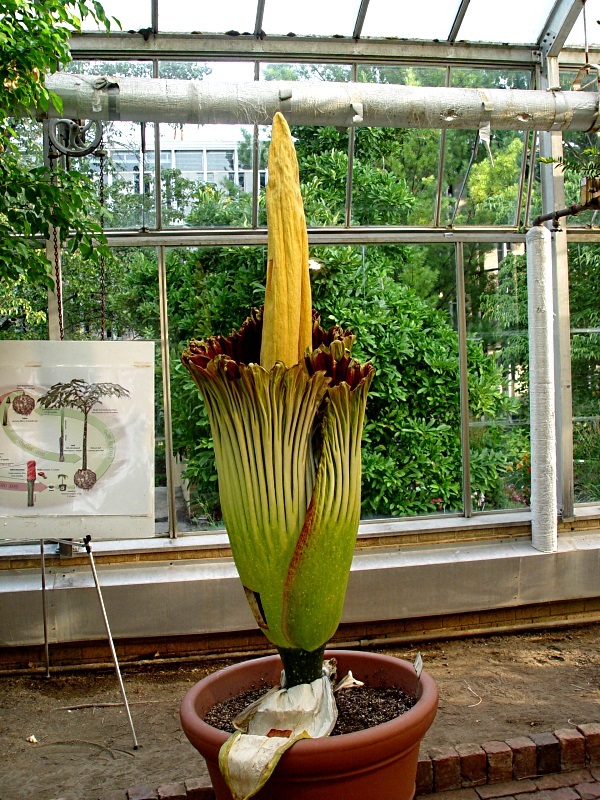 The data from the 2008 and 2010 bloom show that those inflorescences were 66.75" tall/38.5" circumference and 72.0" tall/ 39.0" circumference, respectively, when they bloomed. 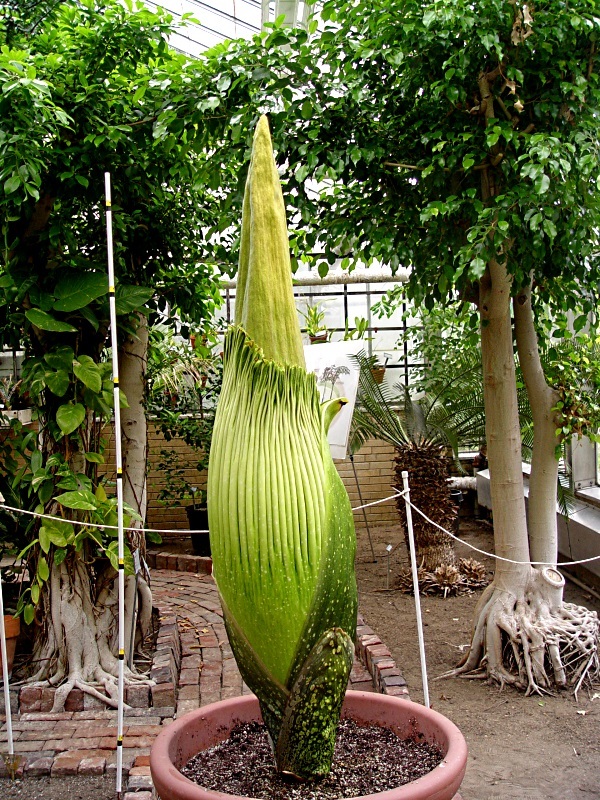 So, we have a little more to go before this inflorescence becomes a record breaker. But, if we still have another week-ish to go, I think we'll make it. Just another 14.75" in height and 2.75" in circumference needed. Grow baby! Grow! July 4. 2014. 52.25" tall and 34.5" circumference. A fly stopped by and walked around on the spadix this afternoon. Sorry fella, you're too early. 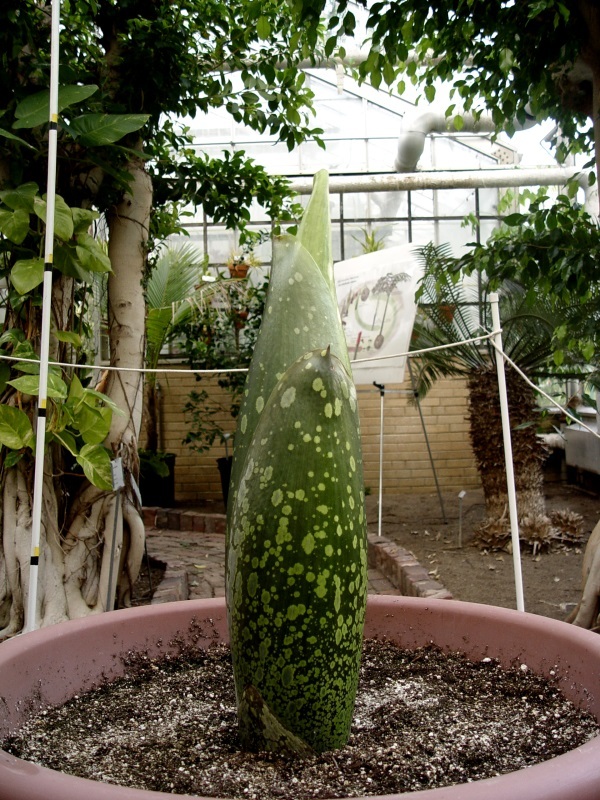 The spadix is still growing about four inches per day, that's a good sign, but I'd like to see six inches per day. The spathe is getting wider every day, but no sign of blushing yet. July 3,2014. 48.0" tall and 31.2" circumference. Today's greenhouse weather was chilly. Brrrr. in the 60s this morning. Now warmed up to a whole 74 degrees. Its supposed to get down into the mid 50s tonight. That will definitely slow developmental progress. Well, at least it isn't in the upper 90s. July 2, 2014. 44.25" tall and 30.0" circumference. Today's greenhouse weather was cool, in the 70s and it was nice enough to work inside today. Too bad I was outside pulling weeds in the garden. However, it was also a nice day to be outside pulling weeds in the garden. I have to pull at least a five-gallon bucket of weeds a day, every day just to keep up with the little critters. 5:30 P.M. This is getting HUGE! 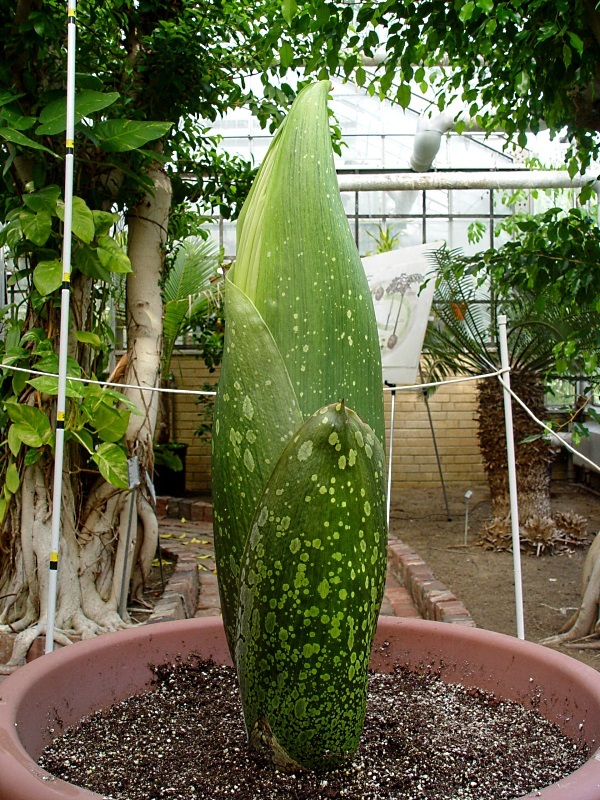 The spadix should start to grow fast now. I'd like to see five or six inches of height added each day. June 30, 2014. 36.5" tall and 25.5" circumference. 8:00 A.M. Looking at the live broadcast from home this morning, it appeared the spathe was peeking out from between the bracts. When I looked at it up close and personal in the greenhouse, it was indeed showing a bit of spathe. No spadix yet, though. 5:30 P.M. The spathe is definitely busting out. 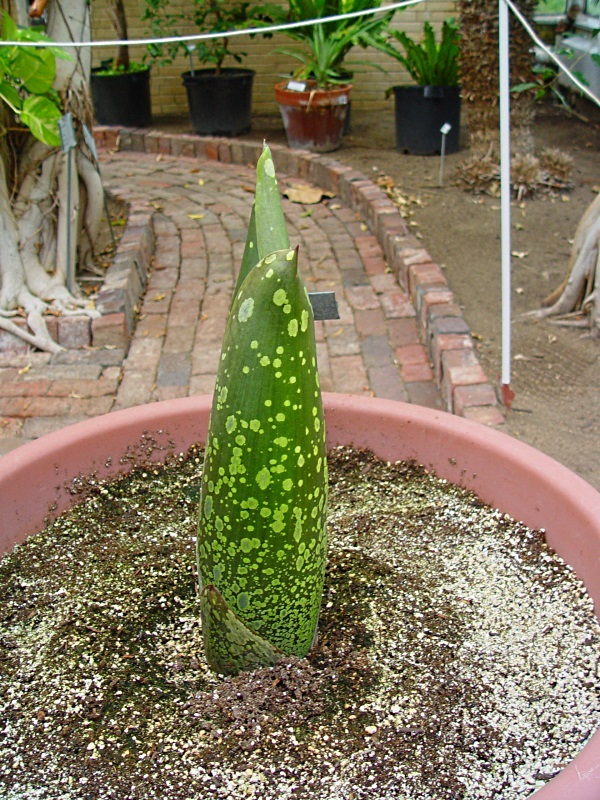 The spadix, not yet. 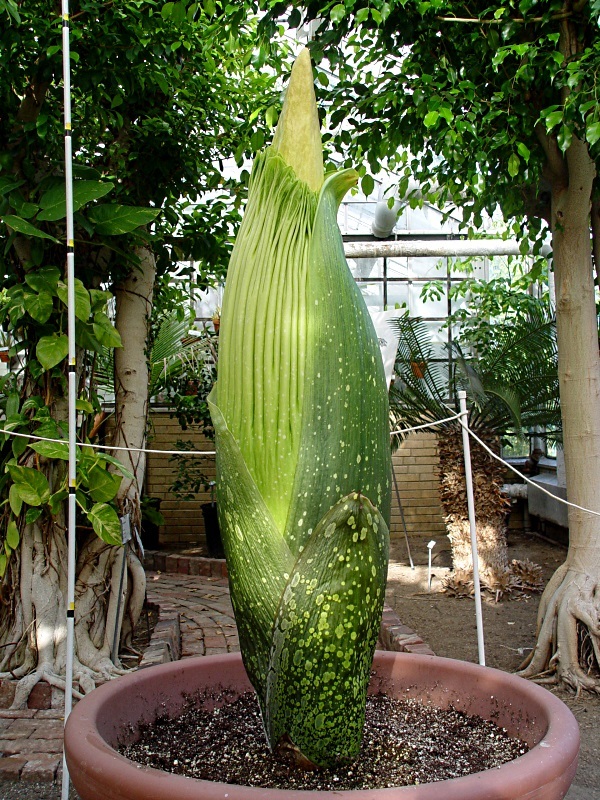 However, I can feel the spadix at the top of the outermost bract. It should bust out sometime tonight. June 29, 2014. The bud is 34.5" tall and 23.5" in circumference. No spadix yet. I'm thinkin' if the spadix doesn't emerge until the bud is in the neighborhood of 40" tall, this is going to be one ginormous inflorescence! Yes Sir! June 28, 2014. The bud is 31.75" tall and 22.25" in circumference. No spadix yet. ...so I bent over the soil steam sterilizer and grabbed the edge of the heavy, hinged cover, heaved it open to look inside, and discovered a paper wasp nest... with my face! Eyeball to compound eyeball with a whole herd of paper wasps! Dropped the cover! Bang! After I calmed down a bit, and they calmed down a bit, I went back and gently raised the cover again, propping it open with a 2x4. After I calmed down a bit, and they calmed down a bit, I got myself a broom and slowly approached the nest. They were not happy. I was happy. Adrenaline rush! June 27, 2014. The bud is 29.25" tall and 20.5" in circumference. Starting to grow like a weed! Hope to see the spadix emerge in a day or two. June 26, 2014. The bud is 27" tall and 19" in circumference. No sign of the spadix yet. June 24, 2014. The bud is 24" tall. It looks like the spadix could emerge any day now. 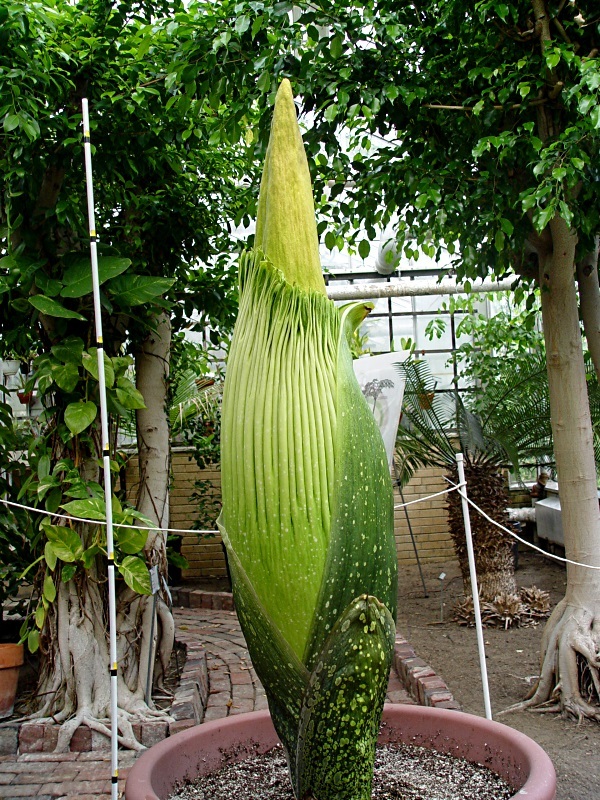 However, in 2010, the spadix did not emerge until the bud was 30" tall. So.We.Wait. June 23, 2014. The bud is now 22" tall. June in Illinois. Hot, Hazy and Humid in the greenhouse. 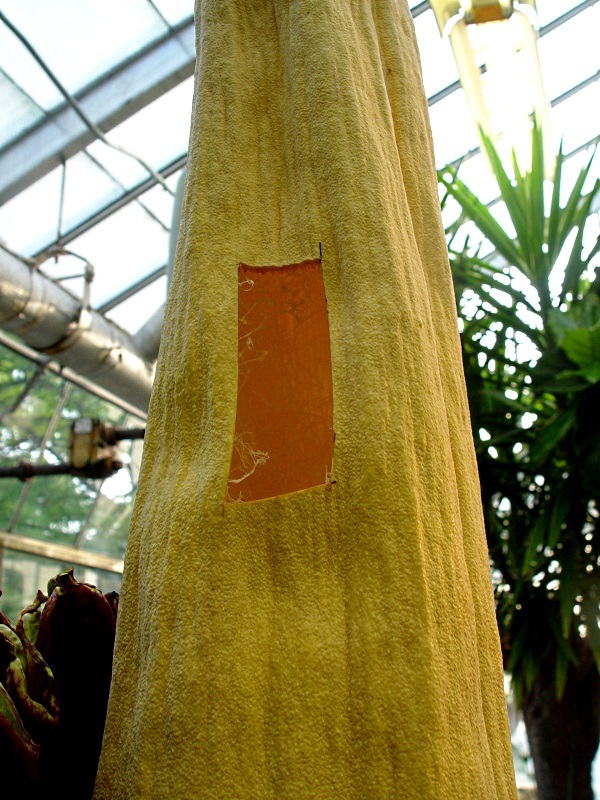 Perfect weather for a Titan Arum! June 22, 2014. The bud is now 20" tall and definitely looks pregnant. 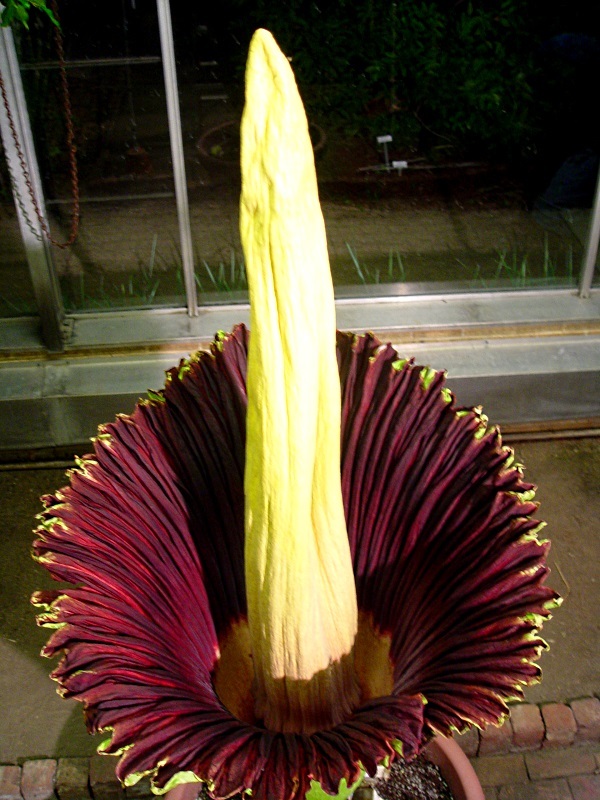 At this height, the previous blooms took between fourteen and seventeen days to open. So it could bloom sometime between July 7 and July 10. We'll just have to wait and see what happens! June 13, 2014. The bud is now 9" tall and is looking suspiciously pregnant. However, I can neither confirm nor deny that it will flower this summer. If it does flower, I expect the bloom to open in late July or early August. June 2, 2014. The tuber poked its little head above the surface of the potting soil this past weekend. It now measures 4.5" tall. One of the tuber-babies now has three leaves sprouting from it. Triple Weirdness. The 7-gram tuber-baby did not survive. Sigh. May 18, 2014. The tuber just broke dormancy this weekend, producing a little pip of a bud. We'll have to wait awhile to find out if it's a leaf bud or a flower bud. Most of the plant babies continue to thrive. Three of them (10, 14 and 19 grams) sprouted two leaves! One (the smallest one at 7 grams) developed a little bit of rot at the base of the leaf and the leaf fell off. It may not survive. I took the tuber out of the pot and weighed it before repotting it. Sixty-two pounds! 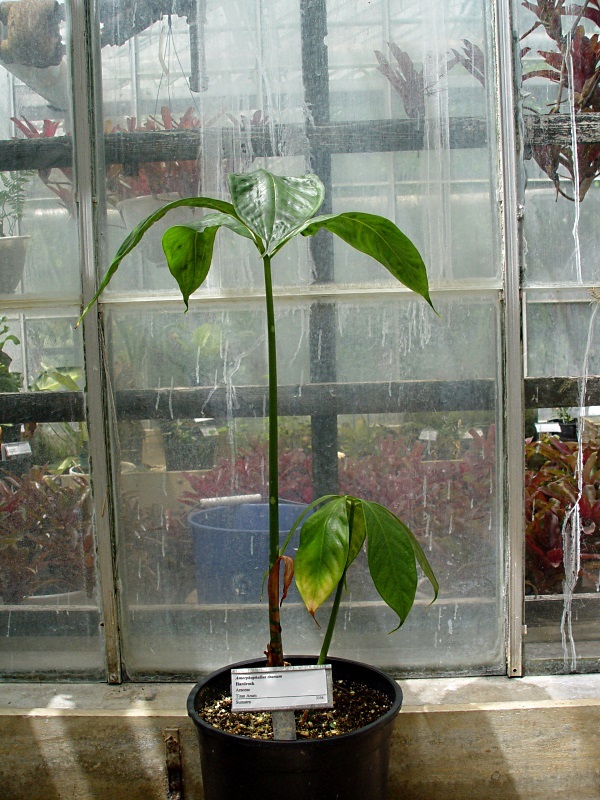 Our titan arum tuber had a problem with rot when I removed it from the pot back in 2011, so I put the dormant tuber on a shelf to dry rather than leave it in a moist soil-less potting mix. While moving the tuber into a metal tray in March, 2012, a 16.5 gram portion broke off, so I potted the chip up to see what would happen. The little tuber-baby sprouted and grew nicely for a year before going dormant. Unfortunately, a chipmunk (Alvin) discovered the dormant tuber in its pot, dug it up, and carried it off. Harrumph. 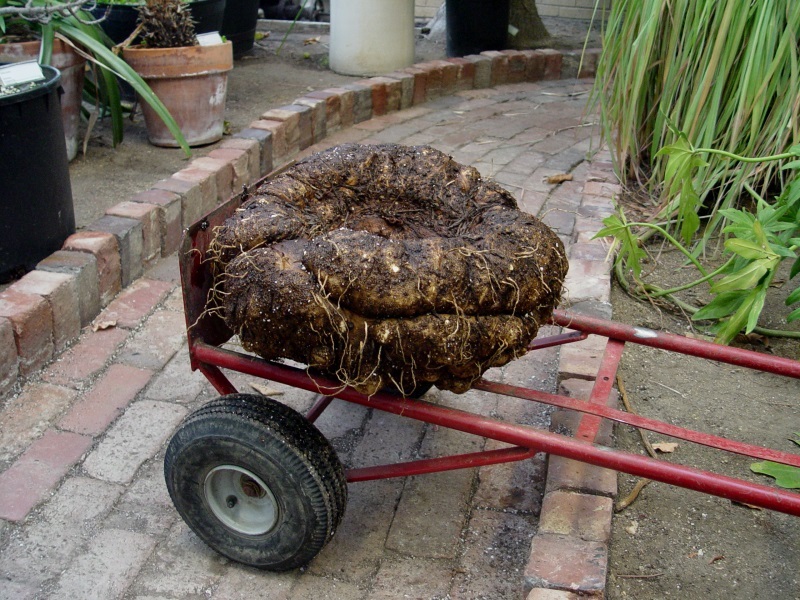 I potted the main tuber up when it broke dormancy in April, 2012, but the inflorescence it produced in July, 2012 was stunted, distorted and split. After the inflorescence collapsed, I removed the tuber from the pot and discovered there were no roots! This would help explain why the inflorescence was so pitiful. 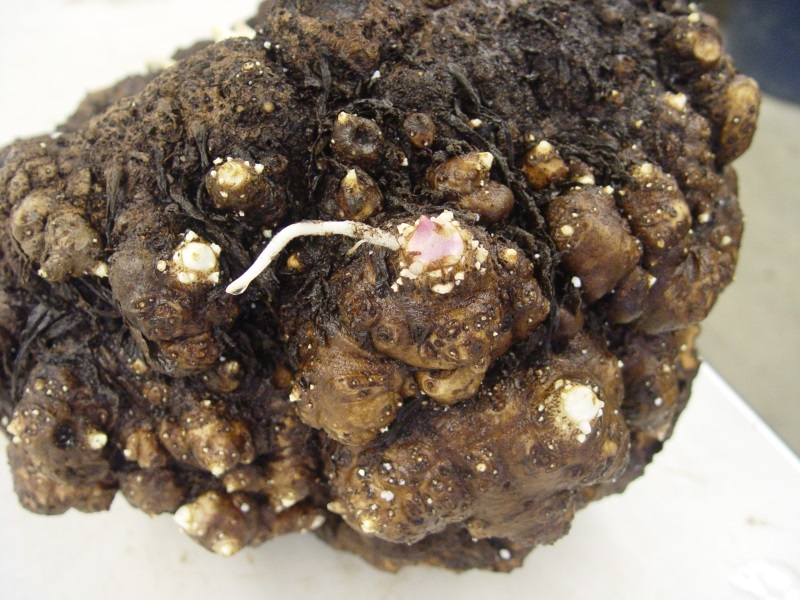 I also noticed that the tuber had a large number of buds all over its surface, some of which had roots developing around them. I cut eight of the buds off and put the main tuber back in the pot with fresh soil-less mix. The tuber-babies ranged in size from about 2 to 20 grams. The remaining three smallest tuber-babies (about 2 grams each) did not survive, rotting away without any sign of breaking dormancy. 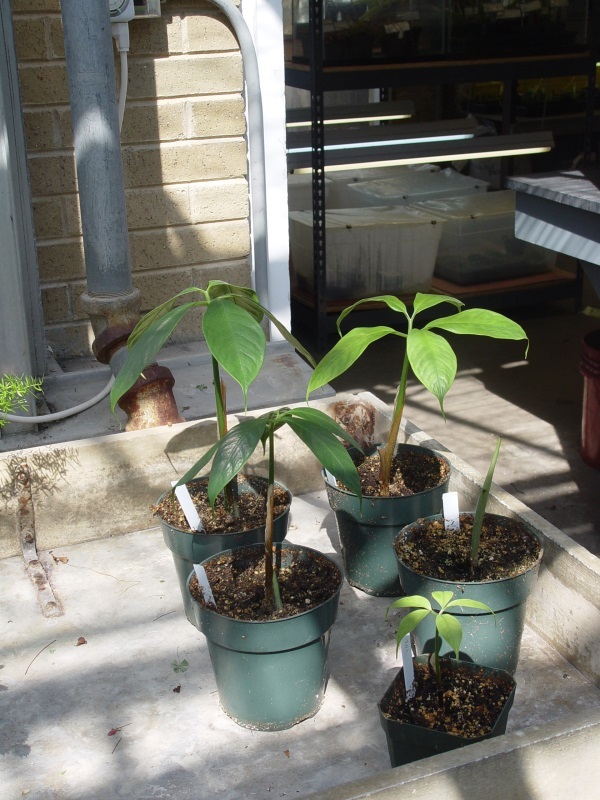 So, I now have five Titan Arum clones to take care of. Fortunately, Mama Titan Arum did not produce hundreds of leaves from the multitude of buds (which was my fear) and, instead, produced a single leaf from the center. It grew vegetatively until October, 2013 and then went dormant. The leaf finished collapsing in mid December and now I'm waiting to see what it will do this year. Hopefully, it will break dormancy soon and produce another (hopefully better) inflorescence sometime in June or July.